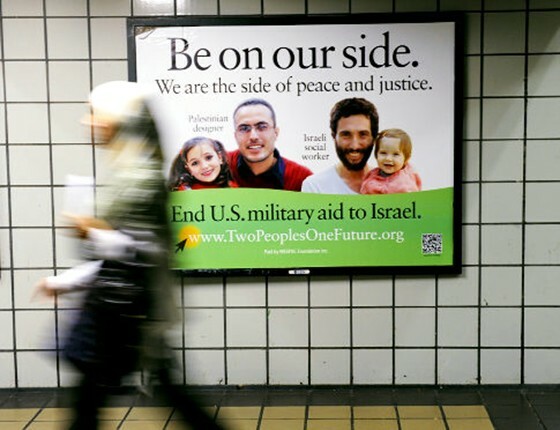 Beneath the slogan: “Be on our side – we are on the side of peace and justice”, a couple of nice-looking young men, a Palestinian designer and an Israeli social worker, plus their children, gaze out of the poster that appeared on the New York subway last week. I passed it a few times before registering the message at the bottom of the ad, an appeal to end US military aid to Israel, which is timed for the Palestinian application for statehood at the UN Security Council this week. To the European eye, the message isn’t particularly alarming, in fact barely worth noting, but in one of the great Jewish cities of the world it is regarded as inflammatory. In no time, local Jewish leaders were on TV claiming that the poster was anti-Israel, possibly even anti-Jewish, regardless of the fact that the campaign was paid for by a group that included many Jews and it raises a legitimate issue. One of the depressing parts of the intractable Middle East problem is the chill that descends on any discussion in the United States about the future of Palestine or, indeed, US support for Israel. Apart from occasional press comment, notably in the New York Times, the media stay clear of criticising Israel, while politicians live in fear of offending the Jewish vote in a country where elections are never more that two years away. When John Mearsheimer and Stephen Walt’s book The Israel Lobby came out four years ago, they were firstly pilloried and then the book was buried, so that their proposition that Israel’s supporters distorted American foreign policy to the detriment of both Israel and America was never properly tested. That episode dishonoured America’s tradition of unfettered political debate. But the chill is amazingly effective. Even in these straitened times, when the US is running an overdraft of $14 trillion, the American taxpayer unquestioningly continues to stump up about $3bn every year to support Israel’s military and ensure the country’s continued regional dominance. Watching a TV reporter tiptoeing round the story of the subway campaign, which was naturally all about who was going to be offended by the ads, rather than the $3bn, I realised that the problem is not so much American public opinion as the lack of it. Most Americans have decided that it is simply safer to leave Israel out of the discourse. So, unconditional support continues without much review or debate or, for that matter, anyone being able to list the benefits to the American national interest that derive from this alliance. Supporters of Israel in Europe, among which I count myself, find the terms of this uncritical, one-way relationship bizarre and it is unsustainable after three regimes in North Africa have fallen to a genuinely democratic popular movement and a heroic struggle continues in Syria, Bahrain and Yemen. A year ago, the application by the president of the Palestinian Authority, Mahmoud Abbas, to the Security Council for full statehood might have seen premature, but today it is the natural and proper outcome of the liberation that is sweeping through the Arab world. American diplomats and the representative of the Quartet Powers, Tony Blair, fought hard to dissuade Abbas, arguing that the application for statehood, which will be almost certainly vetoed by the US, would dangerously raise expectations in the West Bank and Gaza, when nothing will have changed on the ground. This is true, but there are times when you can’t stand in the way of history. We are at a moment where diplomatic finesse and arguments about timing and convenience count for little, especially after the democratic aspirations of the people in Tunisia, Egypt, Libya and Syria have been warmly welcomed by the US. The inconsistency between the US attitude towards Tunisia, for example, and Palestine seems rank hypocrisy to hundreds of millions of Arabs, whose revolutions, incidentally, were never defined by hatred for Israel or America. The young activists I met on the streets of Tunis and Cairo earlier this year may be wary of both countries but in scores of conversations I had, they talked only about democracy, rights, accountability, jobs and the corruption of their leaders. No one raised Israel or America. That signified an enormous change from the previous generation and provided us with a once-in-a-century opportunity that may be about to be lost. While many in the State Department and the White House recognised what was vital and new about the Arab Spring, they have allowed the American debate, such as it is, to be dominated by myths that the revolutions inevitably contained an Islamist core and that the Arab peoples were preternaturally disposed to tyranny and sweeping Jews into the sea. True, there has already been an eruption of anti-Israeli sentiment in Egypt with the storming of the embassy 10 days ago, but this is nothing compared with what may ensue if Palestinian aspirations are rejected by America and Israel, both of whom have already accepted the principle of two-state solution. A new Palestinian intifada would be a disaster for the Middle East and Israel and in the current turbulence there is no way of knowing where it would end. If Susan Rice, American ambassador to the UN, goes against the wishes of more than 120 countries that support the recognition of a Palestinian state within the 1967 borders and vetoes the move, we can be certain of at least two outcomes: the reduction of American influence in the Middle East and the further isolation of Israel, which this year has already lost two important allies in Egypt and Turkey. A vote against Palestine statehood will also increase Iran’s opportunities to cause mischief and drive a wedge between Saudi Arabia and the US, which some may welcome, though it is probably not in the long-term interests of peace. The Obama administration has failed to bring Israel and Palestine together in meaningful talks and has absolutely nothing but further Israeli prevarication to offer the Palestinians. Though we may fear the consequences, Abbas is right to press the interests of his people this week. We should remember that when Israel applied for membership of the UN in 1949, it argued that issues about refugees and the status of Jerusalem stood a better chance of being resolved if Israel was awarded statehood. That is exactly the Palestinian position. Abbas asks only that Palestine should meet Israel in negotiations as an equal. There is no good reason for a veto and no conceivable upside. It is a tragedy to watch America, compelled by a failure of its national debate and the fear of what Israel’s supporters may do at the next election, to move unerringly towards such a disastrous action.